When I pay this much for a game and realize a single new hero costs almost half as much as the whole game cost me I realize mobile gaming is doomed. This game is fantastic, don’t get me wrong. I love it—not as much as the first three, but I do love it. But it is unacceptable to nag me to buy “gems” and “starter packs” in a PAID GAME. This is not Clans of Clans. When I pay money for a game I expect to get its full content, no less. Will think twice before buying a new game from you guys. Looking again, you even added in-app purchases to your first Kingdom Rush? That game is my favorite mobile game of all time, and IAPs ruin it. I have played all your games many times over and can’t wait to see more missions added to this epic vengeful adventure, thanks for making awesome games over the years. The only game I don’t delete once I finish them. This one is just as good as the others. Best games on the iPhone!! This is by far my favorite kingdom rush game but I would like to know one thing and that is why did you guys not add the enemies list thing like the other kingdom rush games had? I hope you add it in sometime and I would love to see more frequent updates with maps, bosses, heroes (especially free), etc. Thank you for reading! Much anticipated. It delivers in full. I hope we will see newer maps and content otherwise I feel the price was a let down. What's the good of being evil? I've always loved the Kingdom Rush games. The new game concepts in Vengeance are fun and the humor is top notch. But I prefer beating the bad guys not being the bad guys! It's a very different tone in this game that I just can't get used to. And what's the point of losing hearts in this game? In the prior games, the bad guys would get past your defenses and supposedly attack some poor innocent village of nuns and school children or something. But now when a good guy slips past the last tower he's what... fleeing for his life? Why's that cost you a heart? Not my favorite. Let's get back to the excellent game play where I get to rain fire down on some baddies trying to capture a damsel in distress or something! RTS and tower defense fans here is your game. Yo update the game faster. So you can totally beat this game without spending money! But if you are different and like total annihilation then get ready to spend money. In all I think it comes to.... idk maybe $50. I didn’t look at everything in the shop so I’m guessing around $50. The best 5 dallar I spend in a long time. It’s a hard but I love it. I was always a huge fan of these games, and I still am, this game was so fun and I love how you fight as the evil, you get to find out what they used, best mobile game ever! It hurts to give it 2 stars. We all hate ads right? I would much rather pay $5 and maybe if I want to, a couple in app purchases to make the game better, and also support the people who made the game! The fact that there are no ads and people are complaining about in app purchases is kinda annoying. Playing as the enemy and seeing it from the enemy's perspective from the original game is pretty creative. The game is challenging and keeps you hooked, not in an hour's at a time hooked but play a couple levels here, do something else and then continue playing. It is definitely a learning game that is very much worth the time you put in! I very much enjoy this game and haven't put this much time in a game since I was younger! I really like this game but I do have one thing I can’t stand more than anything else. 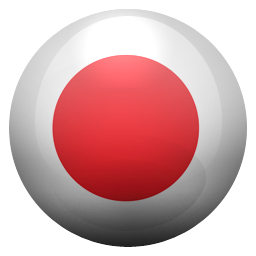 If somebody calls you in the middle of a stage you can’t pick up the call because it will reset you to the beginning. Your game basically crashes. This has happened so many times especially when I’m near the end of the level. Please fix! Awesome! But it could get even better! This game of evil can get even more awe full! More extended storyline and story modes and free buildings. Most importantly, it would be best with a mode with endless waves for setting records to test your own limits! Having an option of having TWO villains would also make the game even better and convincing for not only players, but also those who want to buy this app. I’d highly recommend this do be done to make the evil being more competitive. I’m still rating this a 5 stars, but there’s a problem with light seeker camp on heroic challenge. Every time I’m close to beating it on heroic, I look at my ends to make sure there’s no enemies coming across, but out of nowhere, happening about 5 times now, it says that I was defeated when there was no enemies crossing. That’s it, but this game is one the the best tower defenses. Overall a good game. Bummer so much of the game is pay to play after purchasing the game. I paid 5 dollars for this game and then opened it up to find that most heroes and some towers I have to pay for and there’s no other way to get them. Not cool. I’ve played every kingdom rush released so far and have liked each one. They are well polished and balanced, the only thing I’d like to change is to have an endless stage released earlier rather than later. It doesn’t take too long to beat the stages and once you have leveled up all your heros and beaten the hard difficulty setting there isn’t much fun in replay. Been playing the kingdom rush games since the beginning. This is a great mix up in the genre. Finally playing as the bad guys! I would recommended this to anyone who is a fan of the series or is looking for a great tower defense game to play on your phone or tablet. Enjoy! P.S. I never write reviews. This series is becoming more and more a cash grab. With each new game in the series, you get less with the base game and you can only unlock the better heroes, and now even better towers, through very pricey purchases. This game should be a $10 or $15 purchase for the entire game but it is starting to follow the model of other rip off mobile games. This isn’t a high development cost game, after all, it is fairly simple. That being said, it’s still a well made kingdom rush game, just don’t expect to get much with your base purchase. Kingdom Rush was such an awesome game and this game, I just love it. Too bad I had to purchase this game on my phone but it was pretty much worth it. It’s fun, addictive, and I hope you continue the series. I expected more levels and challenges from this game that I had to PAY for. Pretty disappointing how there’s only 20 level, and as a gamer, it’s not enough. Not only that but we also have to pay for more like heroes and towers. You can still complete the game without them, but it’ll be so much fun if there was a way to unlock them for free. I feel like they are overpriced, if you’re trying to buy all of them. Even at a half price, all the buyable heroes and towers are worth about $30! I hope you continue to update this game. An endless mode, or a mode where it can bring us really late in the game would be very fun. Having max towers is very satisfying. I’ll leave it 3 stars, I expected more from this game costing me about 5 bucks. Very fun but it lasted really short. Best tower defense series ever made. I get devs got families to feed and what not but having a paid for app with everything in it locked behind paywalls is ridiculous. No recognition for returning/legacy players. Only reason I didn’t give it one star is it is good gameplay wise. The rest of it is painful. I don’t wanna get anyone in trouble here, but I told my husband I would do laundry in an hour, 2 hours ago. Dang this is a fun game! I really regret purchasing this game. The in-app purchased are riddled throughout it for most extra gameplay and are not achievable without spending more money. If this was free, I’d understand. The game itself it beautiful and I’ve been a big fan of this series since the beginning. I just feel a little took because I spent $5 for maybe 2/3 of a game. The worst part is this isn’t a free game. You pay $5 for this game but I guess it’s not enough. The best towers and heroes are all locked behind heavily inflated micro transactions. There is a hero that costs $8 to use. That’s more than the initial purchase of the game...don’t download this game no matter how fun people say it is. Supporting this business model and these developers is a terrible idea. The maps in the game are terrible 😥 the occasional map with 2 or more exits is okay but it’s not fun when every single map has 2+ exits. The single exit maps are just better. That’s mainly my beef with the game but also the towers are not that creative in my opinion. I had extremely high hopes for this game and I still love you guys but come on, get your maps together. 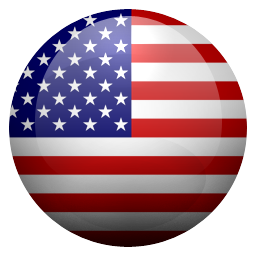 Great but too short - why buy premium content? I’m bummed because I bought some of the premium content w/out realizing the game was so short. 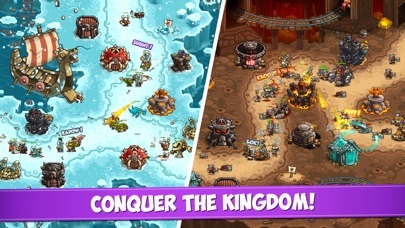 I don’t mind IAP for great games, and this game, like all the other Kingdom Rush games is really fun. The problem is that there are only 16 levels so I feel really ripped off!!!! I recommend that people only pay the $5 and pass on the other transactions. There’s no point in having a fancy tower if there’s no replay value. There should be an endless level. There should be levels where you can use more than 5 towers. There’s no replay value because the old system of playing on casual and then hard for more stars is gone. I’m hopeful that the devs will add twice as much content. Seriously- if they just add like two extra levels I’m going to be really disappointed. Thank you. Game campaign is way shorter and easier than previous games. At least add in a endless wave level for those that beat the game . First off wanted to start by saying AMAZING game I’ve played every TD game made by these developers. This TD was much more challenging the the previous 2 KR games. One thing I like the turret wheel kind like picking a load out. However it makes me miss being able pick two towers in game. I loved the hero’s in the game the unique passives and new abilities are fun to use. One of my concerns is how many purchases were available in this one. I know games have to make money and the campaign was definitely beatable with the basic towers. But I would be devastated if future games couldn’t be beat unless u spent money. That’s all for now just want say amazing game and keep adding more. I fell in love with Kingdom Rush games corporate valuation classes in college and during my early career on flights. I’ve played through them all, and this one just doesn’t feel the same. I’m really just bummed at the lack of levels. Beautiful game, but I’m used to having almost the same number of bonus maps as the campaign. They’re slowly adding more, but it’s been months and such a let down there’s only 3. Love how you can play as Vez’nan! Title explains everything! Great game as always BUT the latest level expansion is designed to be so hard that you have to buy cheat items to beat it. It’s disappointing. I’ve played every single kingdom rush game and this is the first time I’ve seen them do this. One of the very few games I’d ever write a review for an I have literally dozens on my iPhone. This game is very addictive and the small mini games in each levels to find the hidden item of what’s missing is so entertaining. Truly each kingdom rush is s masterpiece don’t change a thing! Great follow up to the old games. New content is fun. The graphics are nice and the gameplay is similar to what I remembered when I played Kingdom Rush a few years ago but there are some annoying things with the game. First, the rounds take a really long time. There needs to be some kind of speed up option otherwise you’re looking at 15 or even 20 minute rounds. Second, the premium towers are severely underpowered. I get that they shouldn’t make the game too easy, but if I’m spending real money on an in game item, I do expect some kind of competitive advantage. I spent $13 to unlock all the towers only for like 1 or 2 of them to be viable. I fear the situation is the same for the heroes which I won’t be buying. Third is less of an issue and just more of expectation which is more game modes and more varied gameplay. My biggest issue is with the premium towers though. Loving the first expansion too. I have been a fan of the series ever since it started. I have played all the games and I absolutely adore them all. This trilogy of games will ruin tower defense games for you. It’s brings new things to the table then the last games. I hope for more levels and heroes soon. These games truly are the best tower defense games ever made in my opinion. Writing this review in an attempt for Kingdom Rush to make survival levels like in the old games!! I loved that! I’ve done everything I can in the game now and would love some continual gameplay! That’s the only reason I can’t give 5 stars! The other games are FIVE STAR GAMES!!! Thank you ironhide for many hours of fun! After you pay the admission fee. The expanded campaign looks to be unbeatable unless you purchase in game currency as the waves become quite huge and unmanageable with your standard army. I paid $4.99 to play a game only to discover more content(towers and heroes) locked behind another paywall. This kind of crap has to stop. 1 star review. Devs did a cash grab after charging $5 now want more money to unlock chars and towers. Lost the essence of the game. Greedy devs. It will only harm the game’s reputation. Anytime I try to make an in store purchase I get the message “please sign into iTunes Store for appleID “%%appleid%%” “ Looks like a bug, other apps allow me to purchase. Regardless this game is awesome, seriously the best. Love the game and series but..
Looks like it’s got the fun of the first games. I am very unhappy to see towers locked behind purchases. This game is probably my favorite of the series. 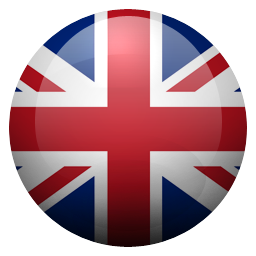 I didn’t mean to purchase the app do you mind refunding the money please and if you do thank you. the game costs $5 but doesn’t even include all of the towers, only about two thirds of them. the rest are $2.99 or more... each! I’ve played all the games in the series and these are worth every penny. I can give this review confidently having bought all of the towers and heros they will let me. This game is fantastic, and as someone who has been in love with this series sense the first one was released on armor games i feel like this is another home run in terms of game design. The levels feel good and challenging, and im looking forward to playing through on impossible after beating it on veteran this week. My big complaint is the money. This game costs five dollars to download, but has in game non essential but also non cosmetic gameplay affecting purchases that you can make, thus the full game is not in my opinion five dollars, but (and this is with the sale for new downloaders) thirty five dollars. For a mobile game this is not normal and is really pushing it. I would not be mad if, like some of the free heros and towers, the bonus content was unlockable via in game action. Tldr: the in game purchases are relevant even tho they are not essential, which is a turn off, as is the price tag if you buy all the purchasable content ontop of the app itself. The gameplay is however worth the five dollar download cost. Hello to all who read this, I had bought the game around December, and had also purchased the Hero and Tower bundles as I thought they would spice up the game, and they did. After about a month of playing, someone had deleted the game off my phone, but after I re-downloaded the game, all my In-App purchases were gone. So I contacted the support team, and within a few days they had reached out to me, and after a few emails back and forth, they were able to help me get back the bundles and I did not have to spend another $25. So thank you IronHide support team, You are the real MVP(s), Jacob. This game is great and runs smoothly and is always entertaining. One thing I need to say is that we should get another part to this game. This would consist of controlling the invading armies more than just tower defense. Just an idea though. Great game keep up the good work. Lacks the depth the older titles held. Played every game in the Kingdom Rush series. This game holds a lot of potential, but here is what to expect from the Kingdom Rushes of the past. The tech tree is very watered down, sporting only 4 trees with some very underwhelming upgrades. Can no longer upgrade tech for specific towers (like being able to extend the barracks rally point range etc.). You can only bring 5 tower types to every game which upgrade linearly to tier 4. (As opposed to the previous games with 4 base towers which at tier 4 allow you to choose between two specialty tower types. This used to be 8 tower options in game) There are quality of life issues with tower abilities, hero abilities, and the way the ai works too. For example, the mausoleum upgrade that lets it hold more spirits is utterly useless. It holds 5 attack charges (up from 3) which it brainlessly shoots at the first unit to come in range. Just have to hope the first thing it shoots isn't a small unit? Kind of stupid. The steam tank hero shoots 6 missiles, but rather than tracking enemies intelligently, it randomly selects sometimes multiple enemies and just tickles them. Or all 6 missiles attack one very weak unit and you waste 4 of them exploding on a dead unit. (Remember previous games where missiles from the mortar towers would find units to kill but if the target died the missiles would keep flying to something else?) I feel that Ironside slipped up with this game, nearly to the point where it feels like this game was made by another company who tried to copy the previous games and fell short. It’s littered with purchases (heros AND towers now), the ai is plain stupid in some aspects that used to he smart and the tech tree is a complete joke. Absolutely no depth anymore. All this and after purchasing a tower to try, I realized that you’re not actually paying for a powerful and fun tower with cool upgrades. No, you’re paying money for a tower that has insignificant strategic differences to their playstyle and not only that, but the upgrades are also generic and completely underwhelming like everything else provided in this game so far. If you’ve never played, go have a blast! I’m going to wait until something changes. Here’s to hoping this game wasn’t a money grab. I had earned all achievements and bought the dragon hero and I deleted the app and reinstalled it recently and everything was gone after their update and had to start all over. It’s a fun game but not quite as food as the others and I never had this problem with the others. I also had this problem with Iron Marines so it seems they like ripping off their customers now with the more recent games. Don’t fall for it. I contacted the support team and they didn’t do anything to fix the problem either. I love the series! Always leaves me wanting more. Hopefully they don’t take too long for the next one! When I first played the original Kingdom Rush all of those years ago, it stood out to me as the best tower defense game I had ever played. Since then, I’ve played all of the Kingdom Rush games that Ironhide has released, and I’ve been a fan ever since. Enter Vengeance. It’s still the same (excellent) tried-and-true battle formula, with a bunch of new tweaks like the slew of new towers, and the ability to customize which towers you take to battle. Similarly, the excellent art style, attention to detail, and hidden joys in each level continue to be a delight. 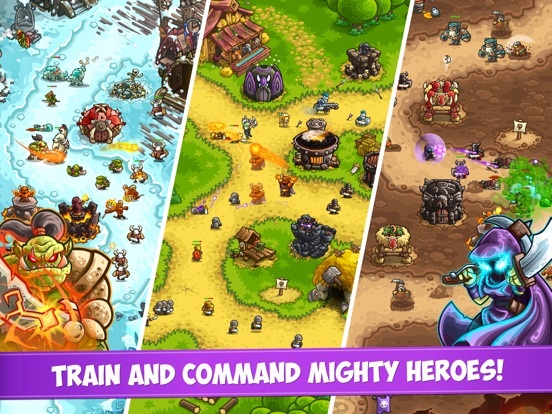 If you’ve played past Kingdom Rush games, then I have no doubt that you’ll love this one, too. If you haven’t, then now’s as good as any to jump in. I had a blast playing it through to completion, and like the others I’ll likely revisit it again in the future to play through it one more time! Also, if you’re worried about the in-game purchases: I was able to complete the game with 100% completion without buying any extra towers or heroes. The ones that come with the game are enough. The concept of this game is fun at first. You build towers to survive the rounds, upgrading your towers as you go. In this game, unlike the others, you can buy towers. This seemingly fun conciept ruins the game. The given towers in previous games had two different upgrades to choose from, and that made the games a lot more fun and interesting. But in this game there is only one upgrade route, so there are few choices in this game. It’s too bad, because the concept and animation are both great. Of all the game franchises that the micro-transaction design model has ruined, this one may hurt the most. See above. Vengeance is a little bit on the easy side when compared to previous titles. Even on the hardest difficulty you will 3 star 9 out of 10 stages no problem. Some of the iron and heroic levels felt underwhelming, but those gripes aside; this game is gorgeous and is another excellent entry in the TD genre. 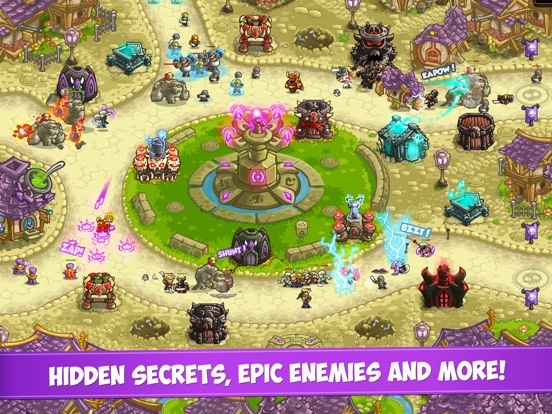 Kingdom rush is my favorite iOS game. I have all series and still keep them on iPad. The game itself has great quality as previous one like it always. I understand ppl don’t like IAP, however it is not same case for kingdom rush. Premium heroes and towers are nice to have but it is not necessary to beat game. The devs bring lots more towers compare to last 3 games. It is not surprised that they charge few of them. I usually purchase some heroes I liked right away to support dev, then purchased all of rest once they are sale later on. It will be the same for tower this time. Some people think they already pay for the game then should get all of the content. But come on, those premium heroes and towers are just DLC which available instantly when game come out. WHY it has to be free? If you can’t afford it, that’s fine. Please don’t complain it any more. Last we all know devs will have update with new campaigns and heroes. Guessing this time if they will release more towers. I am willing to pay if those are cool. I love ironhide and I am especially a fan of their kingdom rush games. The original was fun and basic. 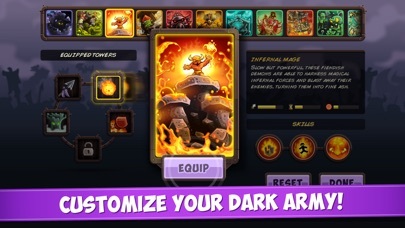 It cost only a few bucks and the in app purchases were completely optional heroes. This was the standard for the first three games. However, with this game ironhide got a little greedy. There are five towers that you can buy to add into your game and in my opinion it creates a tough choice. On the one hand, it cost around 20 dollars for all of the towers. On the other, it makes it feel as though I’m missing a huge facet of the game by not purchasing them. I like vengeance. Maybe even more than the previous games. I’ve even been anticipating it since a few months after the release of origins. But the price of these towers just feels like my kingdom rush games have become another cash grab. I know you make your games relatively cheap. And we all have to make money somehow. But one of the towers alone cost two more dollars than the game itself. I love you ironhide and your kingdom rush games. But I really think the towers should be cheaper or at least introduce a way to buy all the towers at once at a reduced cost. A new twist and another great installment in the series! 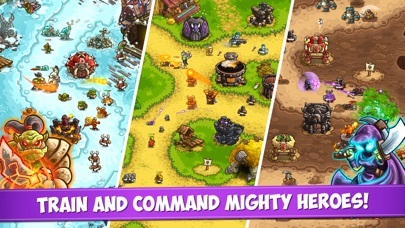 When I first heard another kingdom rush game was out I was excited, but also questioning how they were going to make this one even better than Origins, which was even better than the past games itself. My questions immediately went away after I opened the app and tried it. For starters, The artwork was much better, and the game ran even smoother. I love the ability to customize your tower layout too. It’s a great twist on the original games that makes this one unique. I haven’t finished the game yet, but it’s even harder than the past few, which I love. When the game is challenging, it makes you happier and satisfied when you finally finish the level you’ve been stuck on. The kingdom rush games never fail to surprise me and I would definitely recommend this game to anyone who loves strategy and tower defense games. 10/10, but if your new to the games, I would start with the original and work my way through. Love this game and the whole series! Very polished, lacking end game. I have played and love each of the Ironhide S.A. games. The graphics and animations on Vengeance are superb. I love the new tower mechanic. There are also a variety of new mechanics with the stages and enemies that keep things fresh. On the downside...I was really disappointed when I finished the game and no bonus or endless levels popped up. I had not read any of the reviews yet, so I did not know that this was lacking. Hopefully this can be added in the future. Though I will do them just because they are fun, it is also less fun to not get additional stars for doing the second and third challenges for each stage. I’d love for the talent tree to be a bit more expansive and allow for more stars on the challenges. Lastly, the heroes. While each fun in their own right, only having three feels like a letdown. That goes back to the original game and just seems like a step backwards. Still, for its shortcoming in those departments, it was still a blast to play, and I will continue my way through all of the challenges for some time to come. The game is great and by far the best of the series. I like how you can now customize what towers you use in the game which makes for a great way to change your strategy based on the level. I also love the feel of the game, now that your the Villains we get to see their side of the story which is very entertaining. I also love the little Easter eggs to other series that gives you something to do while the battle is going on. However the draw back of this game is that you have to not only purchase some hero’s but now even the towers? it seems pretty greedy for the amount of content there is. If they were .99 cents maybe that’d be better but really I think it doesn’t feel I should pay 30$ for the whole game. Heck you could keep the prices if you would give us a way to achieve some of the towers or hero’s. Either by achieving some goals or completely levels in certain ways or just saving gems for the towers. This would increase the time to play the game and you’d get the whole game. While Ironhide has made the best mobile games by putting a ton of effort into each and every one there is one thing that makes the game fall below the rest (not by a lot though still 5/5 for gameplay and story). The problem is that it seems to much like iron marines, theres no enemy encyclopedia (which is probably due to game length), there is no way to check the exact stats of the hero’s or towers except for in game (which makes it much harder to consider buying one), and instead of adding more levels they gave you an impossible difficulty which is pointless considering how you have to beat the campaign to unlock and on top of that there’s no proof of beating the game on a harder difficulty which makes playing on then pointless. Not having the encyclopedia or elite levels was a big letdown for me and is my reasoning for giving four stars however I love the new tower mechanic and I love how every tower has 3 upgrades now so outside of these issues it is truly great game and still worth the buy. I saw this game in the App Store omg I wanna get this game so bad, but it was 4.99. I didn’t get the game and saw Iron Marines was out which was free. The moment I finished the first level I hated it. I waited for another tower defense game to come out because I’m obsessed with them and they got a little more popular. I got Bloons td 6 and it Hooked me for a long time. I eventually I became bored and had no clue what to do so I bought this game. I went through the tutorial and I saw you were the bad guy. I didn’t know this till I got the game. Not only that but they beat bloons td6 by having upgrades for your hero and other stuff. They also beat bloons td6 by having more towers not just 4. Not only that but they beat the other kingdom rush’s by not making it as hard. I’d have to say the bad thing about this game is that it is to short. I finished the game in a couple of hours so I’m waiting for a kingdom rush vengeance origins! Another amazing game! But it’s missing one thing. I’d like to start of saying I’v played every Kingdom Rush game to date and I loved all of them. In fact I 100% complete every single one. The one thing I looked forward to in all of these games was the bonus levels after you beat the campaign. These were always super challenging and great fun after you’ve beat all the campaigns iron challenges and such. But they seem to have left them out of this game and that was super disappointing to me. While playing through I would look at spots on the map and say, “That’ll be an extra level for sure” but unfortunately there were none. Please I would love to see the extra levels you guys come up with, especially with all these new towers you have added. (which I love by the way) Overall still a great game, and highly recommend playing if you love tower defense games. I can tell it’s just as good as the others Edit: in some ways. In some it may be worse and others it may be better I have bought Origins many times. The latest in a new Air. It looks gorgeous there as all their games do no matter the device. I bought this game even though I only have an SE. It looks great but want to show support to get a desktop version. I don’t think I’ll buy the heroes or towers until I upgrade or it come out on desktop I don’t game much but I keep coming back to Kingdom Rush. They are fantastic This one changed up some elements with how the upgrades and towers work. Now the upgrade trees is more console and smaller only having 4 groups. Which at first seems like less options but it’s just more streamlined now and makes sense with the big pool of towers Meanwhile there is a pool of towers to pick from. Both of these changes have pros and cons. I liked the major change in the last upgrade level to towers where you pick a specialization for each in the previous games. It gave a bit of strategy. Now the strategy is in picking which towers you equip something I will have to wait and see once I unlock all the towers. I hope they expand on this game and continue to release more maps, towers and heroes as they did with the last. I will wait for a desktop version to really get into the extra content. Basically this game is 5/5 hands down. I’ve played the other 3 kingdom rush games so many times that I was finally wanting something new. Then a 4th kingdom rush was announced a while back and here it is. Extremely satisfied with it, can’t wait for the bonus campaigns to come out too. Now people complain about towers that have to be bought but they are highly unnecessary. I finished the game already one highest difficulty with 3 stars on all campaigns plus iron and heroic challenges without much issue since I’m seasoned at the rush games at this point. But with decent planning and good strategy this game is DEFINITELY NOT pay to win. Now one thing is some powers of the towers feel underpowered such as the shadow archer crow. But other wise it’s not that bad since u can replace shadow archers easily with boomerang or the bone tower. Anyways great and hope for more soon. Its a good game that offers an array of possibilities except for one problem; it is way too short. So, some complaints have been about a few towers that are behind a paywall. The paywall doesn't bother me too much. As the developer commented in one response I read (paraphrasing), “the pay towers are there just to add some new possibilities and also if you just want to experiment with them.” Thats fair enough. However, what makes no sense is that they want you to buy towers and them provide only the campaign stages to use them on. And those stages ended up being way too easy at any difficulty and the whole campaign can be beat in a single day. To unlock the whole game with all the towers and heros would be about $30. That’s insane. $30 dollars for a game that can only be played on a handful of maps. And dont forget all that nonsense in the first 7 stages where you can’t even level up to full strength and the enemies practically fall over dead from exhaustion. What exactly is fun about that? They’ve done it again! Another great game by ironhide. I’ve played every single one of their games, and they never seem to disappoint. I love how they have used a colored map in this one, and some more changes, such as no more tower upgrade paths but instead you can choose different towers. I don’t like that change much, but maybe because I’m not used to that. The only complaint that I have is that there are no extra missions once you have finished the campaign, unlike the other games. The upgrade tree should have a few more upgrades, but everything else is fine. They probably don’t have extra missions because of how new this game is, but hopefully they will be added in the near future. Nonetheless, great game, and if you like it, you will enjoy their other games as well. Keep it up, Ironhide! The gameplay is there, the great art is there... but somehow this falls short of the other games. It has fewer Easter eggs on the stages, which are generally more static and less interesting overall compared to Origins, Frontiers, etc. The enemy paths also seem less inventive - with fewer mid-level surprises (are there any? I’m about half way through...). The new “mix and match” tower mechanic feels more limiting than anything (you have fewer to work with per round, even when they’re all unlocked). The different upgrade system makes doing other level modes kinda pointless, except to buy one-use items in the shop. I dunno... This is the first game in the series that simply feels like a rehash - and less like a loving effort. That all said, it’s still extremely enjoyable. Ironhide simply set the bar too high for themselves on past games for this one to get five stars. This game is great, I think the best of the series (and it’s a phenomenal series). The game is genuinely polished and well made, the care that this studio takes to make mobile games is apparent in this one just like in all on their titles. The thing that really makes me happy about this game is the pay structure. In an era of game developers trying to relentlessly cram monetization down our throats, ironhide does it super well. You can buy everything with real money, including new towers, but what you can buy does not overshadow what you unlock by playing and I felt like they showed me respect while adding more monetization to the game. I bought stuff in this game because I wanted more cool content, not because the game wasn’t fun without it. Awesome game, this studio is the golden goose of mobile games as of now. I have all the kingdom rush games and iron marines which I all loved playing, however this newest installment is different by paying for towers... seriously?! I was completely fine that you had to pay for heroes since it did not majorly affect the gameplay, and it was still do-able with the free heroes. Now I am stuck with either buying heroes or unlocking ALL the towers first,(which is about $23 tax not included). I gave one star just because it was a KR game, another star since the graphics were beautiful, and the third star for the awesome switch as being the “bad guys” in this installment of Kingdom Rush. I really love you creators but when I saw in-game that you made towers an in-app purchase, it just made me sad ;(. If it wasnt for that, then I would have rated it 5/5. Also I checked the in-app purchases on this game on itunes and it doesnt even include purchase costs of towers nor does it list them. First off I just want to say this game is a huge improvement over origins and is tons of fun. However, I noticed some quality of life was removed and was kind of disappointed. First off, where are the multiple save files? One thing I liked about the previous games is that I could try to complete the campaign with some challenges in mind, such as beating the game with no star upgrades. It was reassuring to do this knowing my main save file was still there. Now you can’t do this anymore. Secondly, what happened to the encyclopedia? In previous games, I liked to read the many bios on the enemies. It’s just not here in this game! Instead, you just have to rely on the one pop up card from each enemy, which is just not enough because you’ll forget each bio in due time. Add these two things back into the game and my review will become 5 stars. Amazing, and nothing less than expected.. 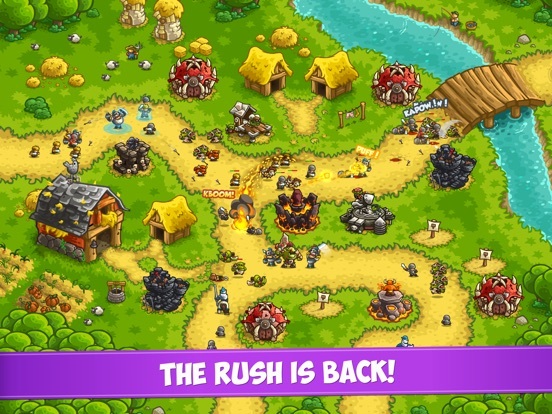 The Kingdom Rush series of games have all been excellent and Rush: Vengeance is no different. All around amazing game and I'm always looking forward to new additions to the games and the series itself.. As a dedicated veteran of the series I find this game very fun and engaging and would recommend it to anyone who's teetering on the line of whether they want to buy this game or not. P.S. [To Devs] The game itself is amazing, but y'all should give people challenges in order to get the towers locked behind pay walls.. They're not necessarily needed to excel in the game but they're nice additions to anyone's load out into a level. That is my only gripe of the game, so if you guys could put in some way to attain these towers in game or, lower the actual monetary price of the towers themselves. I suppose that I’ve come to expect a certain degree of quality from iron hide’s games and this one does not disappoint. I played through the whole campaign and the addition of tower loadouts make this game feel fresh and new. The idea of playing as the bad guys for once is awesome, though I do hope that sometime in the future we can play as the attackers instead of the defenders. The heroes are awesome, and the towers all feel unique. There are an incredible amount of new enemies, and I’m excited for whatever is next to come for this game. I will admit that there is not much to do at the moment, so I’m hoping that an endless mode is added as well as a few new stages. This has been the case for the other entries in this series. Great job once again guys. I have bought all the Kingdom Rush games because they are good fun and my 6 year old likes playing them with me. This one is not different. It was fun to play. I liked the new towers, although I don’t think you need most of the towers. I liked the twist that you were playing the bad guy. Overall, it was fun. What I did not like was the lack of ability to have multiple different games going at one time. In the past versions you could have three games going at once. This allowed me to play my own game, my son to play his own game, and one joint game. I can live without that, although it did bum me out. The lack of additional campaigns and quests after you finish the main game is a real bummer and why I dropped the rating to three stars. In the last versions there were additional campaigns you could play. Those were a lot of fun and are missing from this version. I don’t worry about the in app purchases, we don’t buy any of them. You don’t need any of them. we won the game with all the free towers, I suspect you can do just fine without any of the new towers that were introduced. But losing the additional campaigns is a blow. The game cost the same as the others but has about 1/3 less content in it. Seriously bummed out by that. So. This is a thing, I guess. For six or seven years I’ve been a huge fan of this franchise, and I played the crap out of the original, Frontiers, and Origins. I bought most but not all of the heroes for all three, so I’m pretty well invested here. Vengeance is familiar but different. The core gameplay hasn’t much changed. But the UI aesthetic seems to have taken a cue from the current crop of free to play games. Don’t get me wrong — this isn’t a sleazy money grabbing F2P title. But it kind of looks a little like one now. You can buy towers now. Dunno how I feel about that, but it’s not like there aren’t plenty of free towers in the game so I don’t think it bothers me much. What I really don’t like is that they’ve changed the upgrades. You don’t spend stars, you occasionally level up. And the skill trees aren’t based on towers now, which I suppose makes sense because they’ve added a bunch of new towers. But it makes it less clear what’s going on with the upgrade system. And you don’t seem to get anything for completing the challenges for each board, unlike previous titles (where you’d get one upgrade star). That’s kind of a bummer. Overall ... it’s good? I guess? But I’m not that excited about it. This game was an absolute blast from start to finish. But once I’d completed all 15 levels that was it. I purchased the premium towers at the beginning with the discount because these are truly worthy developers of some excellent games. Once you’ve beaten all the levels the game is no longer fresh and exciting. I think it needs an endless mode or three and possibly daily challenges with special rewards. I think it would be neat if you could swap out abilities like the goonies or green fire rain for different abilities like how you can with the heroes. And more free heroes. Special missions that unlock after the main ones like in kr frontiers would be nice also. In conclusion the only thing keeping this game from truly accomplishing greatness is replay value. That is a quite difficult thing to request of these developers but it would really be awesome. TLDR: An uninspired cash grab that seems like it was rushed without much thought on value. Game mechanics are not as well thought out as previous games. Fun while it lasted but replay value is low. I own every KingdomRush and Iron Marines by Ironside; this is by far the quickest play both in terms of challenge (yes I played on hardest difficulty) and content. The heroes are ok, though some of their mechanics are copied from previous games heroes. The third hero to unlock seems like a throw away and underpowered. Previous games have endless challenges and other special stages. There are none of these in the game. Once you’re done ‘Campaign’ you’re done the game. The developer tries to throw some map challenges (the 6 and 1 elite waves) at you using the pay for towers to tease you into buying them. These micro transactions are not micro, some towers coming it at $5 a piece. They don’t make games like these anymore on mobile devices. Most games have a pay wall or you have to subscribe to pay. But this game is just that, a full game, with an awesome campaign. So much replay ability and of course if you want to buy different characters and towers, you can, but you are not penalized if you don’t want to. I fully support this developer because all of the kingdom rush games are amazing. If you are still debating buying this game, don’t, it’s an amazing game you won’t regret buying. Plus, they are whole lot cheaper than other less quality games out in the mobile world. Also this game uses the pro motion feature and plays at 60 FPS, so buttery smooth. Thanks Ironhide, keep it up, I love your content. I have played all of iron hides game and I’m a huge fan of the developer. The game is very fun, but the progression feels a bit lacking. The upgrade tree for towers is smaller than previous games and you will most likely have it completed before you finish the game. For me this is an issue because in previous titles I loved going back on the harder difficulties to earn more stars and continue to put points into my tower skills. There really is no reason here to go back and replay on a harder difficulty. Also, it’s nice having 5 towers to chose from but overall it feels like a downgrade because previously each tower had two options for its final upgrade which left more room for strategy. My final complaint is that for 5 dollars the game seems rather short. I love this game so much, and it’s been the best out of all the games so far. I really enjoy it, and I have no problems with it at all. I was thinking the other day, about a little twist you could put in the game. I thought it would be a little more fitting with the plot as the player being the bad guys raiding the good guys. I thought about the player being the one sending the troops and trying to get past the defenses. It could be fun, and add a little twist to the gameplay. You could add it as a mini game, or even as a game mode that you could switch to in the settings. Just a fun suggestion. Developers, I hope you read and consider this, because it could be very fun. But overall, this is an amazing game and keep it up! I inadvertently played Kingdom Rush I when it came out, and have been addicted to the series since then. With each edition’s distinct features and updates that follow a yet cleverly designed, surprisingly consistent model of game style, this game is, in my humble opinion, the best tower defense game on iPhone and one of the best ever existed. What even adds to the amazingness of this game is the company’s adherence to the old school profit model- the player pays upfront fees, and while there are some in-app purchase options, paying the upfront fee gives you most of the game content and great game experience, even if you choose not to buy the in-app purchase options. Applause to Ironhide. I truly hope to continue playing your game in many years to come. I would pay 5 dollars for few mobile games. But as soon as I saw that this was coming out, I knew I would get it on the first day. This series has been a part of my childhood for years and I believe it should be a part of everyone’s life because Ironhide has really done something nobody else has. In my opinion, each game has gotten better and better and after only maybe an hour of playing Vengeance, I’m blown away. If you’re on the edge about getting this game, throw your worries aside and get it. The amount of new features, fantastic art, and the fact that you get to play as the bad guy, which is in no other Kingdom Rush game, is absurd and has worked perfectly in Ironhide’s favor. Definitely recommend this game!!! Thank you guys. Just in time for the holidays. You guys are truly a great game developer. Your games look like amazing works of art, with Easter eggs and references to pop culture that rock. As an old gamer I have always enjoyed tower defense games and your titles are super fun with tons of replay value. In an era where almost all games on phones are just black holes for money, I love that you keep coming up with creative titles. This is another great one and a good evolution of past games. The upgrade system is really improved, and heroes have variances that are enjoyable. The prices for the unique towers is a little steep but overall the game is another solid title. Great QA and Unit Testing during development, you can tell right away! Happy Holidays! Ive played the other games religiously and loved each one but I think I’d still have to pick frontiers and origins over this one Positives - animation and sounds are amazing as usual - nice switch up to play as the bad guys - the levels are a bit challenging, which I liked because I’d have to retry a couple times - I really liked the upgrades with the soul stones in this game, they were very useful Negatives - I felt like the towers were lacking and not as fun as previous ones. Some were boring and the special abilities were boring, which the other games never had a problem with. - I felt like there wasn’t a big variety of enemies in this game, and there was no encyclopedia to show them :( - I think you should’ve gotten more tower slots because in the previous game, you were able to get 8 different towers with all the upgrades. - I didn’t think it was a terrible idea to pay for towers, but at least make them cooler and a bit stronger. - it should be longer, but I’m guessing an update will come soon with more levels and heroes Maybe I’m a bit bias and love playing as the good guys. Regardless, I love these games so much. Towers nerfed. Enemies buffed. Pay to succeed. Cash grab. Long time player. Beat all your games on multiple platforms. Spent extra money on them even. It was earned by making good fair and balanced game. But this trash is stupid. All the the original towers have been nerfed into the ground. All the enemies have been buffed to insane degrees. Special enemies where no problem in later levels. But special enemies every level after 2? I can barely stave off normal units with the Dragon helping. Let alone enemies who can’t be hurt except for two seconds after dashing down the map. Or enemies that just buff on stalling units. Or healers. Or blah blah. This isn’t ok early game. It’s way to difficult and just encourages spending on the ONE TIME USE items in the store. You guys didn’t need this slummy tactic. I don’t mind Bloons TD 3 Dollars for a always double money because it’s always there. One time use items are a stupid cash grab with the massive difficulty spike. I’m sorry I ever supported this company. I have deleted every critical review I had about this game. I’ve played since the first Kingdom Rush came out. It’s just so much fun, and I’ll get by the fact there’s towers you have to buy (which I bought along with the heroes of course) but I do have one request: What happened to the encyclopedia saying what the enemies did, and stuff like that? That’s my only thing I would like. Thanks for taking the time to read this! Oh, also to mention, the expendable troops that come with the bought hero, the doom tank, can eventually be upgraded to “riflemen”. I noticed that they make no noise when they shoot, and that slightly irritates me because I like the noise they should make >:(. Other than that I found no flaws. I have all of the kingdom rush games and have been a long time fan of the series. They’ve gotten increasingly greedy with more and more content requiring IAP with RL$$s. Unfortunately this iteration is the first to feature purchasable TOWERS, not just heroes. The $5 cost of the game is a lie and to even access all of the towers you have to drop another $11. KR is a great franchise but NOT a $16 game. 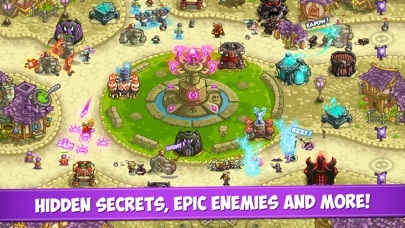 Purchasable heroes with totally optional powers maybe but towers that change how the game is played completely ruins the “hard but not impossible without IAP” difficulty level of the prior games and makes this just another TD game (with the same mechanics as every other TD) asking for your paycheck. If they make the towers free and heroes freemium it’s a $5 game that I’m happy to have purchased. Otherwise, it’s a greedy freemium game without the decency to start of free and my last iron hide purchase. Like all the previous versions of this title, I love this game! First of all I live that I can pay a little more for the entire game and not have to micro transaction my way through the content - thank you, thank you Ironside for using this pay to play model! Second, the structure and game play mechanisms are easy, but scalable, repeatable, and variable for hours of challenging entertainment (I sound like a commercial, I know, but this is what a game is SUPPOSED to be)! Art and animations are great; storyline is fun and relates to the previous versions; and all the achievements and side references to pop geek culture are icing on an awesome cake! Yes, every sentence in this review ends with an exclamation point...but that’s because I want to shout how great this game is! Everything about Vengeance is just good enough. Not excellent, not great, just good enough. 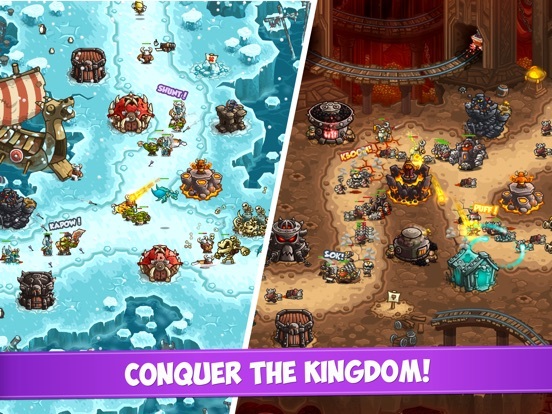 All the things you come to expect from Kingdom Rush are there but mostly undercooked. Ideas are short, stages are a little less creative, it's like they released version 0.8 My biggest complaint would be the lack of challenge. I don't mind if they want to make it easy for new players but you have a difficulty called "impossible", locked for only when you've completed the game. Yet this difficulty is easily passable often on your first try. That was their time to get some longevity out of the game but overall it feels like nobody play tested this very much. The challenge is not there so any sense of engagement is gone, it just starts to feel like a mindless grind. Looking forward to some updates that fix this, but as of right now the game feels finished but not polished. Message to the developers, if you're going to call it impossible, go all out. Make it challenging. As it is some stages feel finished and others feel like filler. Overall, disappointing but only because you've set the standard so high on the other games. .....for creating such an epic game! 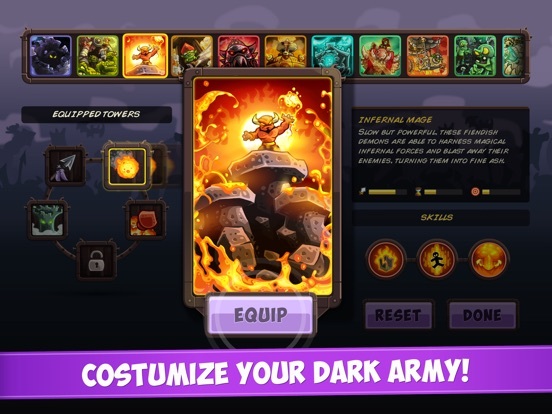 I remembered the first kingdom rush back in 2011 and I truly admire how you guys have kept your brand integrity. Even in the midst of all the pay to play schemes and loot box gaming, you still find ways to make the game play extremely entertaining and fun! I gladly spent 25 bucks to unlock all towers and heroes because you guys truly deserve it. I am 31 years old now and don't play much games but this is truly amazing. I strive to unlock every achievement and truly enjoy the small little games like whack a mole. Graphics are so detailed and just beautiful. Thank you guys so much for not losing out to the industry but instead kept the standards high on what it means to have an awesome gaming experience! I’ve played for about 2 hours now and I can say that this is (in my opinion) the greatest and most intuitive Kingdom Rush game yet. The levels and the map are absolutely GORGEOUS (playing on an IPad Air 2) and the attacks from the towers & enemies are so polished. My only complaint (right now) with the game is that 5 of the 11 towers cost money to play with, and 6 of the 9 heroes too. I know it’s too late, but I don’t like the new change of having towers cost money. I also know that we’ve never gotten more than 4 towers before, but, I still don’t like this move in a $5 game. Overall, good job Ironhide. 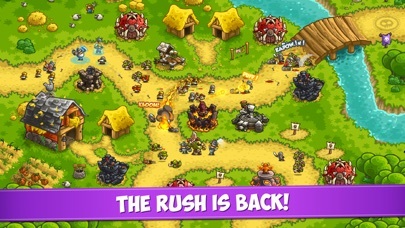 Expecting, to see Kingdom Rush 5 in the next 3 years (maybe cover dwarves?). Provides the same kind of gameplay and fun we enjoyed with the first three installments, so if you liked those you'll enjoy this one. I have two complaints, so I subtracted one star for each. First, veteran mode is waaaay too easy. I flew through the game in two or three sittings getting three stars on each level. One of the things I enjoyed most about the other games was getting stuck and trying to find the winning strategy. I think the creators were busy finding other ways to squeeze in paid content (which is my second complaint) and forgot to polish the actual components of the game itself. There are tons of extra towers you can use if you want to throw the creators some more money (because paying for and outright owning a game is just history now apparently). Pros •GREAT gameplay •GREAT new mechanics to play around with •Everything works together, nothing is too OP or doesn’t make sense in the game •Amazing cartoon style graphics. •many hidden Easter eggs here and there that are a joy to find Cons •You play as the bad guys in this game, and I feel they did a bad job at making you FEEL like the bad guys. In the beginning it’s goofy and Vez’nan is supposed to be funny, but I feel it takes away from the point that you are EVIL in this game. In that aspect it feels like your just fighting random enemies and not eradicating humans to exact your vengeance. •Many Heroes seem copy and pasted from earlier games just with new skins. Like Alrich and mirage for your first and second heroes this time it’s a orc who might as well be the same hero as alrich and a sneaky assassin with a bow and a knife that jumps from place to place, sound familiar? Also there’s a new dragon. •it takes a bit of gameplay to really pick up but I would barely consider this a con. Overall you should play it. It’s fun and a great new edition to the franchise but I feel like it could have been just a little bit better. It is really fun to play it now.